It’s getting colder, and at this time of year I like to check the weather forecast to see how I should be dressing for the days to come, be it with jumpers and hoodies or a raincoat and Wellies. Apps such as wetter.com are good for preparing for the days ahead: making sure one knows what the weather will be like so that one is prepared for cold nights and/or rainy days. Find out more about wetter.com in today’s review! Please note that wetter.com functions are currently available for Germany, Spain, Austria and Switzerland. When you first start up wetter.com you will see the app overview, and there’s a bar near the top of the display in which you can enter the postal codes or street names of places that you wish to add to the overview. There’s also the ‘Current Location’ function if you want to set your location. Click on a city and a daily and weekly weather forecast opens up. When you click on the daily overview you can check out what the weather will be like throughout the entire day. Lots of detail here: aside from the usual temperature facts and general weather conditions there are also details about wind direction and velocity, as well as likelihood and amount of precipitation. You can scroll through the days or cities from left to right, depending on which overview you are using. A bar at the bottom display weather functions, reports, radar and videos. The ‘Reports’ category gives résumés of the forecasts for the next days in Germany, Austria and Switzerland. 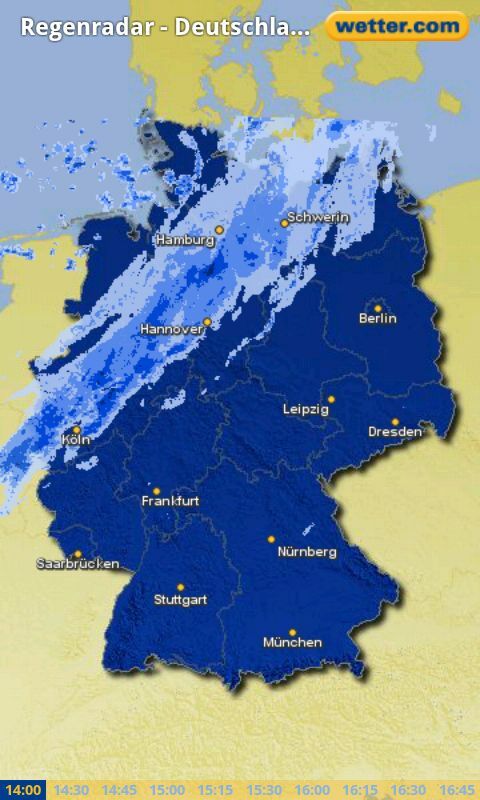 The ‘Radar’ option displays a rain chart for Germany or Spain. Throughout our test run, this option would display the weather from 2PM-4:45PM when we checked at 5PM, which raises the question of how useful this function actually is. It would makes sense it if it were possible to scroll through the entire day. 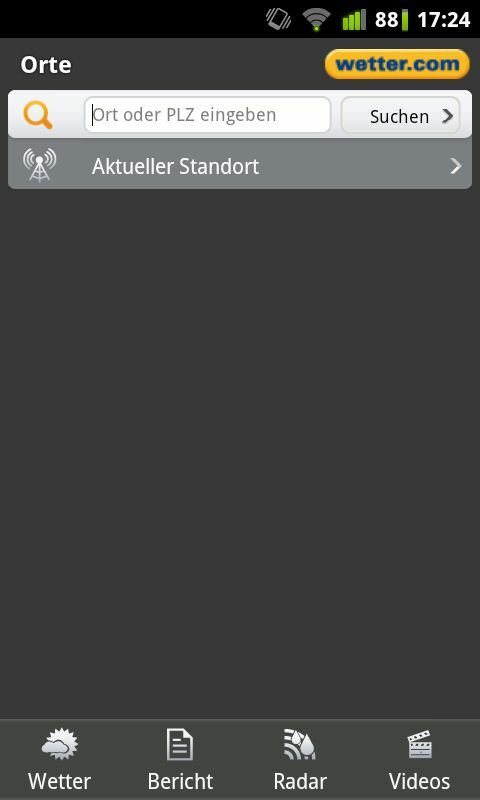 Last but not least: the Videos tab is a video broadcast for all of Germany. The videos aren’t as professional as what you might be accustomed to from telly, but there’s certainly enough detail there to keep you informed. 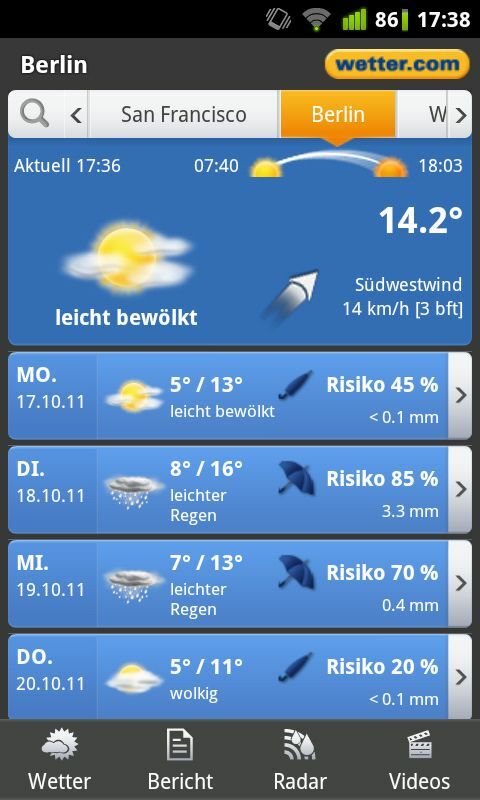 The app also features a widget, which can be used to display the weather for a specific city on the homescreen. This is the only available widget (other weather apps have bigger widgets that can display entire weather forecasts). A few settings options are possible: the measurement units, deleting cached data and de-activating two optional statistics. 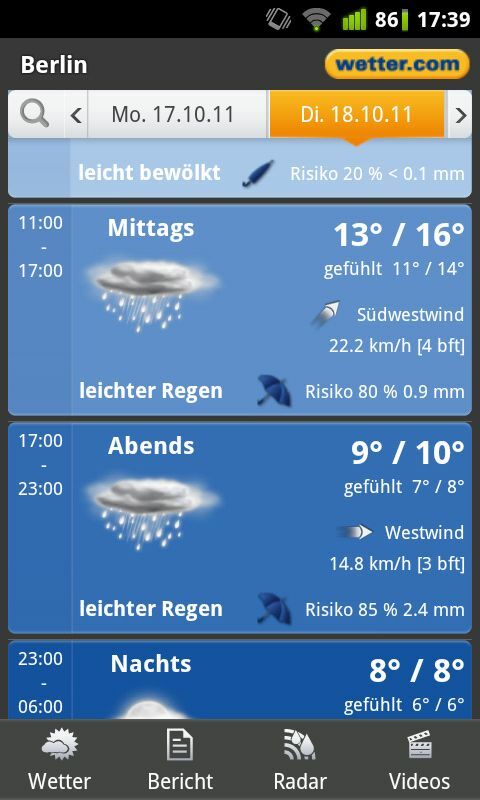 The Android app wetter.com is a simple kind of app that relays information regarding the weather using videos, texts and images, so there’s something in it for everyone. It would be great if there were more widgets to choose from. The app does provide users with a lot of useful information, but there’s still room for improvement as far as adding more functions goes. Still, overall the app impressed us. The wetter.com UI is nice ad sleek (no animations) and the controls are intuitive and easy to use. It isn’t adaptable for Honeycomb tablets, but can still be used. wetter.com performed very well throughout our test runs: it didn’t crash and the app’s speed is great. Loading the weather data can sometimes take a bit of time. You can download wetter.com for free from the Android Market or the AndroidPIT App Center; there are add banners to contend with.